At this point, I’ve seen enough. It’s becoming quite clear that Facebook’s Mark Zuckerberg wants to be President of these United States. The topic first piqued my interest about a week ago when I read an article published at Vanity Fair titled, Will Mark Zuckerberg be Our Next President? Increasingly, a number of influential people in Silicon Valley seem to think that Mark Zuckerberg will likely run for president of the United States one day. And some people, including myself, believe that he could indeed win. “He wants to be emperor” is a phrase that has become common among people who have known him over the years. Then, this morning, I came across the following tweets. When Facebook went public five years ago, the world had a pretty vivid picture of who Mark Zuckerberg was. As much as anything, that image was of Jesse Eisenberg’s fictionalized performance as Zuckerberg in The Social Network: an intense, socially inept kid billionaire who always wore a hoodie, whether he was meeting with financiers or trying to screw a co-founder in court. Over the past couple of years, Zuckerberg has made a concerted effort to steer his image in a different direction. Zuckerberg has help, lots of it. Typically, a handful of Facebook employees manage communications just for him, helping write his posts and speeches, while an additional dozen or so delete harassing comments and spam on his page, say two people familiar with the matter. Facebook also has professional photographers snap Zuckerberg, say, taking a run in Beijing or reading to his daughter. Among them is Charles Ommanney, known most recently for his work covering the refugee crisis for the Washington Post. Company spokeswoman Vanessa Chan says Facebook is an easy way for executives to connect with various audiences. While plenty of chief executive officers have image managers, the scale of this team is something different. 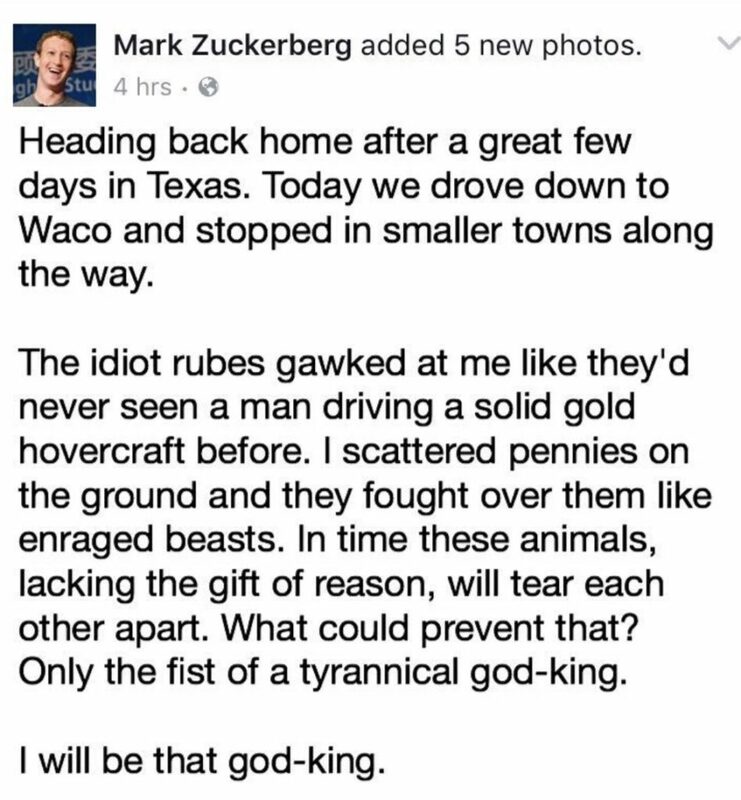 Naturally, Zuck doesn’t spend all of his free time smooching on Texas babies. So what’s he doing in between the professional photo shoots, Dothraki feasts, and playing cuddly tech oligarch for “ordinary” Americans? Well he’s suing native Hawaiians to get off his 700-acre, $100 million estate on the Hawaiian island of Kauai, of course. Mark Zuckerberg is suing Hawaiian families in an attempt to get them to sell their land to make his 700-acre property more secluded, a Honolulu newspaper reported Wednesday. Almost a dozen of small parcels on the Facebook co-founder’s $100 million Kauai property belong to Hawaiian citizens who acquired them through legislation dating back to 1850, called the Kuleana Act, according to the Star Advertiser. As such, these land owners are allowed to walk through Zuckerberg’s domain. But the billionaire is believed to have filed lawsuits against a few hundred people in the hope that they will sell their parcels at a public auction. Using the law to induce land sales, which isn’t uncommon in Hawaii, can be viewed as problematic because it severs the native Hawaiian community’s link to ancestral land. Zuckerberg is believed to have sued a few hundred people via several companies that he controls, the Star Advertiser reported. Some of these people, who inherited or owned interest in the land, are dead. Similar auctions have in the past led to below-market sales, but according to the Star Advertiser, some of those involved in the Zuckerberg cases believe the billionaire will offer a fair amount of money. I know that’s a lot to take in, so let me end this post with a little humor.